I recently had a stall at the Newcastle Early Childhood Intervention Coordination Program Expo. Being my first ever expo, I pondered for a long time about what I should have at the stall. Should I get some pens with my logo on? Should I do lolly bags for the kids? What about balloons? I was going round and round in my mind until a few days before when one of my lovely wee clients (let’s call him ‘Sam’) gave me some inspiration. We were walking from Sam’s classroom to the treatment room having a casual chat, when Sam stopped, looked me in the eye, and said “I really want to start today with Mr Bally. Is that ok?”. We continued walking while he talked about how much he loved Mr Bally and how he’d been looking forward to playing with him all week. How could I refuse!? So many of the kids I see adore this cute little guy, and he’s such an easy creation. I decided there and then that I needed to bring Mr Bally (and 30 of his brothers) to the expo with me. And I was so pleased that I did because he was a huge hit! Once word got out about Mr Bally, it seemed that everyone wanted one. He was flying off my table like hotcakes! Eventually I ran out and had to promise the disappointed ones who missed out that I would post the instructions on my blog. So true to my word, here it is. I should say here that I didn’t invent Mr Bally. He’s been around for a very long time and I would say that most OT’s around the world would have at least one or two Mr Bally’s in their kit. This is Mr Bally and he is HUNGRY! Your child will have lots of fun feeding him his favourite food – pompoms. While they are busy having fun, they will also be working on their hand strength and the coordination of the fine muscles in their hand (Occupational Therapists call this ‘dexterity’). Hand strength and dexterity are so important for things like doing up buttons and zippers; using cutlery and scissors; or writing with a pencil. If your child finds any of these types of activities tricky then let Mr Bally help. To make Mr Bally you will need a tennis ball, a permanent marker to draw on eyes, a Stanley Knife to cut the mouth and 3 pom poms for ‘food’ (or marbles, or buttons etc).One thing to remember when making the slit for his mouth is that, the wider the slit the easier it is to operate him. 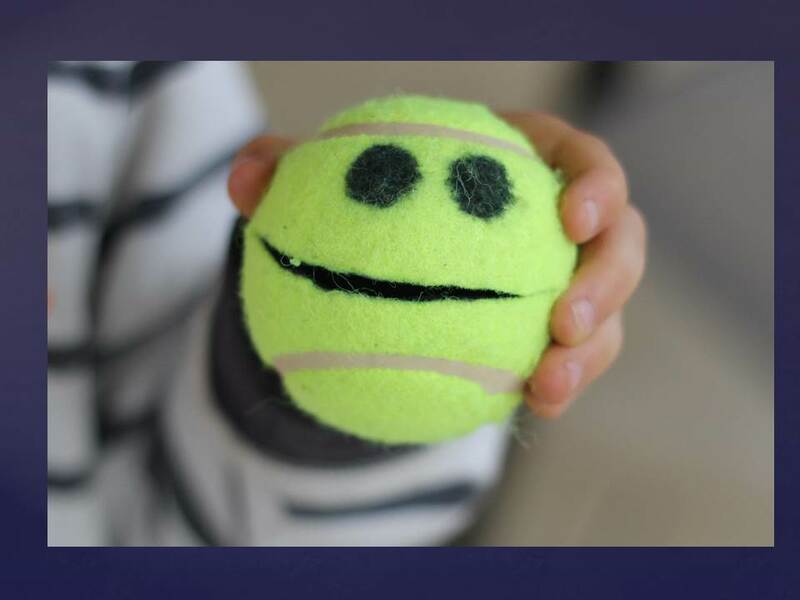 If your little one has very weak hands, then give Mr Bally a nice wide mouth so that it’s not too hard to squeeze the mouth open. For more of a challenge, give him a small mouth. 1. 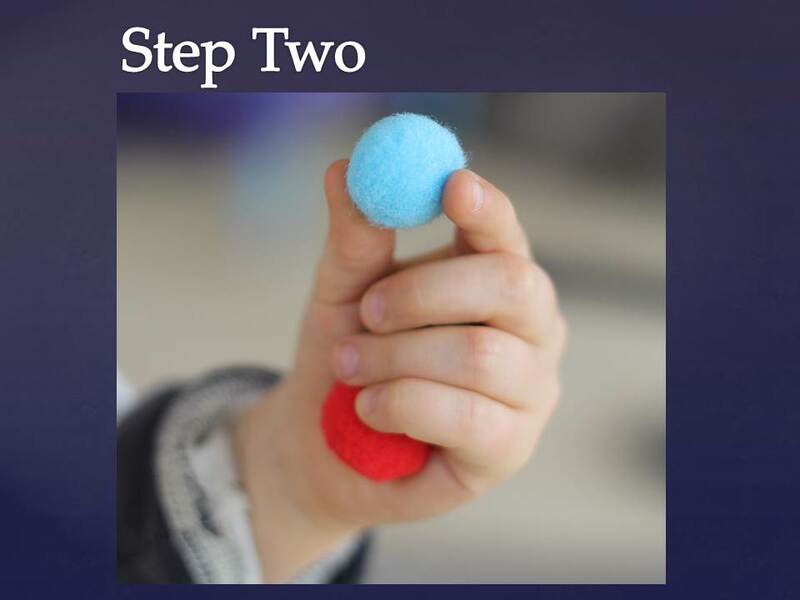 Place all 3 pompoms into the child’s palm. 2. 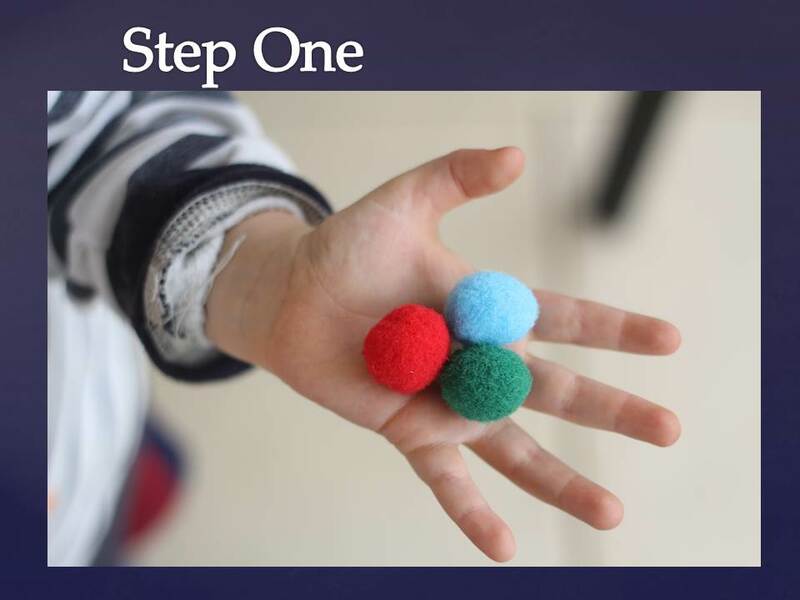 Two pompoms are held in the palm, while the child moves 1 up to the pincer (between the thumb & index fingers). Moving items from the palm to the fingers is an important dexterity skill. 3. Squeeze Mr Bally’s cheeks to open his mouth wide & feed him the pompom. Encourage your child to make Mr Bally ‘chew’ his food by squeezing and releasing several times, strengthening those little hands even more. 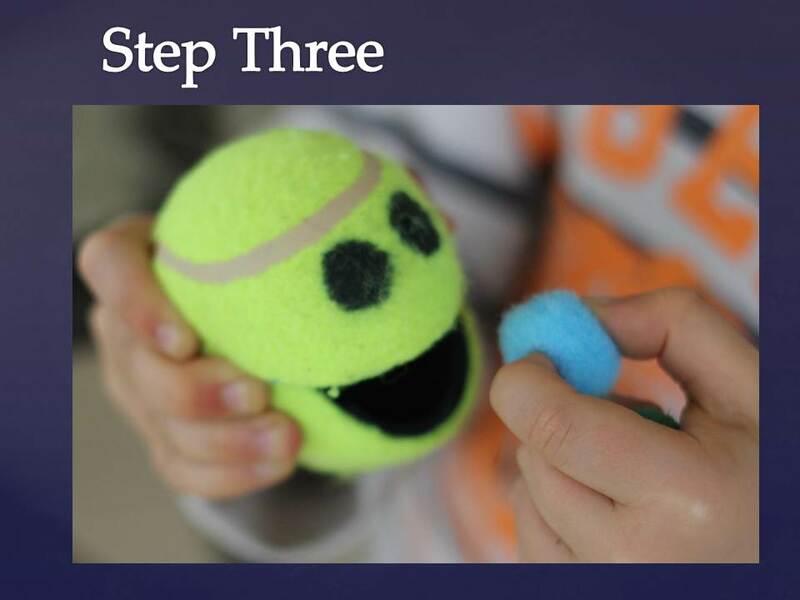 Your child then repeats until Mr Bally has eaten all 3 pompoms. It’s now time to swap hands. If your child fed Mr Bally with their right hand, it’s now the left hands’ turn to feed him. If your child is struggling with this activity and also has trouble with buttons and zippers; using cutlery and scissors; or writing with a pencil then it’s probably worth having a chat with an Occupational Therapist about an assessment. WARNING: Not intended for children under three years. Pompoms may pose a choking hazard.